Our Editorial Assistant Emily has just returned from yet another visit to Turkey’s Mediterranean coast, where she spent her time exploring and marvelling at ancient sites (in between stints on the beach, of course!). Here she shares her top 10 favourites, all within easy reach of our fabulous boutique hotels. Turkey is one of the world’s most historically significant countries. It’s the place our ancestors started farming, home to the ancient city of Troy, and the birthplace of Santa Claus (aka St Nicholas). It was also travelled by St. Paul (the founder of Christianity), Alexander the Great and Hadrian, and was the honeymoon destination of Antony and Cleopatra. It’s littered with impressive sites – in fact, it’s believed that there are over 40,000 significant sites, of which only 300 have been excavated. This means that it’s impossibly hard to know where to begin! 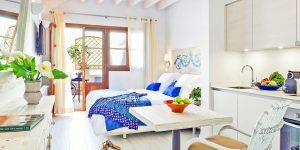 Here are a handful of my favourites, all easily accessible from our spoiling Mediterranean-coast boltholes. 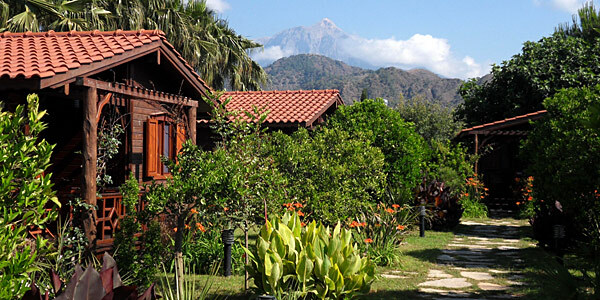 Pack up a camera, book a car and road trip from Antalya to Dalaman, enjoying stylish rooms, spectacular scenery and mind-blowing history along the way. 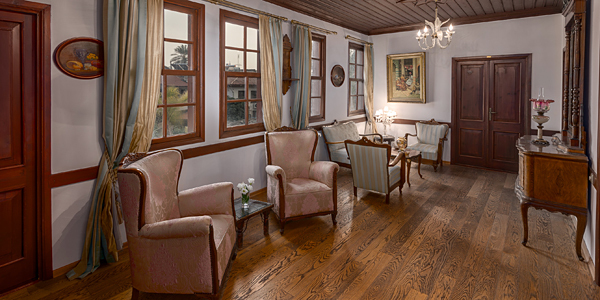 Tuvana Hotel is a haven in the heart of Kaleiçi (Antalya’s fortressed old town). The town is impressive in itself, and boasts a Roman harbour as well as a gate which was built for the arrival of Hadrian (of Scottish wall fame). 1. On your doorstep is the Antalya Archaeological Museum, which houses over 5,000 artefacts and works of art from prehistoric to Ottoman times. My favourite section was the bit filled with the most ornately carved sarcophagi, some of which depicted scenes from Homer’s Iliad and Hercules’ 12 labours. 2. Heading inland, just 35km away you come across one of Turkey’s more impressive – and well preserved – ancient sites: Termessos. 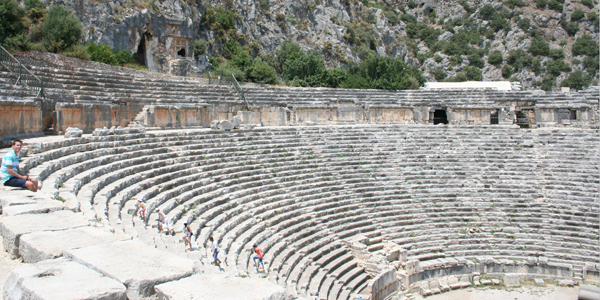 Set in a national park in the Taurus Mountains, this fortress city encompasses a ruined theatre, an odeon, cisterns, tombs and, high above them, a necropolis. They’re scattered around a large area of rocky terrain, surrounded by pine trees and rare plants, with spectacular views. 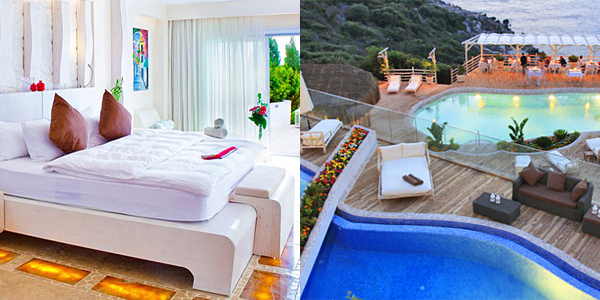 Azur Hotel is located in the seaside town of Cirali, whose beach is flanked by the ancient site of Olympos and the natural phenomenon of the Chimera (flames which lap out of rocks on the hillside). It’s possibly one of my all-time favourite destinations thanks to its 2-mile stretch of sand and laidback atmosphere – plus it’s a nesting place for the endangered loggerhead turtle, which has been in existence for 40 million years! 3. 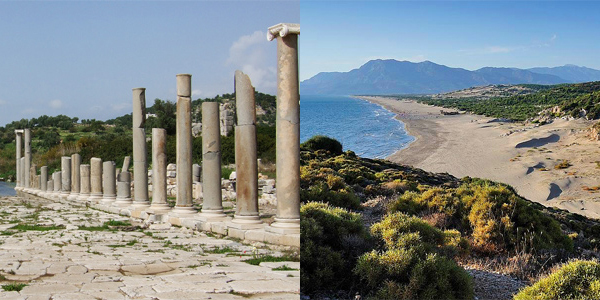 Combine a lazy day on the sand with a visit to ancient Olympos, a key 2nd century BC Lycian port city. You’re able to go off-piste and discover walkways, temple doorways, old staircases and hundreds of broken fragments which provide an insight into this once-great metropolis. There’s something incredible about walking under an archway into an overgrown glade to discover an amphitheatre – it’s a place for your imagination to run wild. 4. 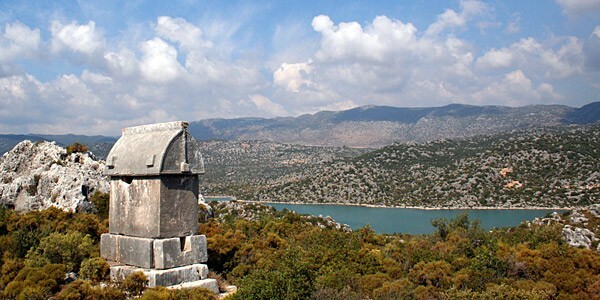 Drive 15 minutes east (or, if you’re feeling adventurous, walk along the Lycian Way) and you’ll come to Phaselis, a 2500-year-old port town which straddles 3 picturesque bays. There’s a well-preserved aqueduct, streets lined with engraved pillars, and an amphitheatre on the hillside which looks up to Mt Tahtali. 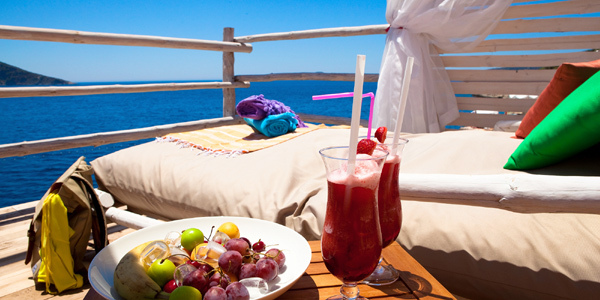 Located just outside the pretty harbour town of Kas, you find the romantic cliff-top retreat Peninsula Gardens. 5. 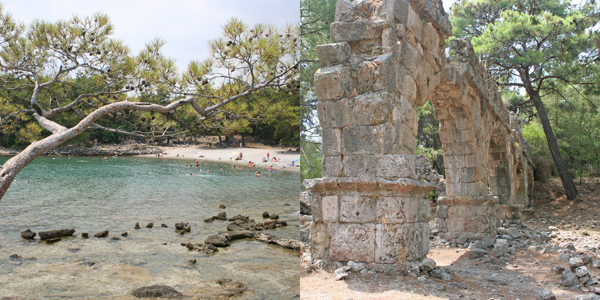 The hotel can arrange boat trips to the haunting sunken city of Kekova (destroyed by an earthquake in the 2nd century AD). I loved drifting along between sections of heavily decorated rocks and daydreaming about what was once there. 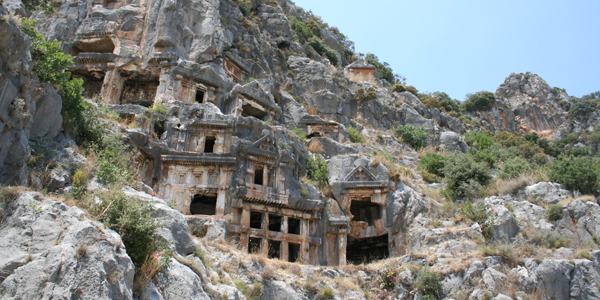 Stop off on the island and you’ll be able to view a Lycian necropolis and the remains of a Byzantine chapel. 6. Just a short way inland is Myra, known for its amphitheatre (which is decorated with carved masks) and breath-taking rock tombs built into the sheer cliff; I strained my neck gazing up! 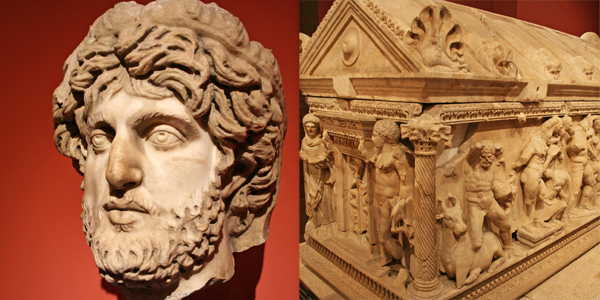 The town has also attracted some pretty famous visitors, including St Paul and Hadrian. Next door is Demre, where you’ll find St Nicholas’ church and tomb (don’t tell the kids!). 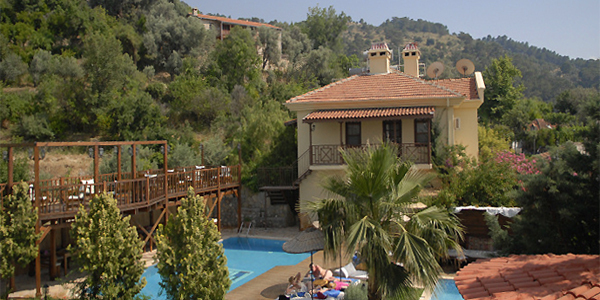 Likya Gardens is the sister hotel to Peninsula Gardens, and is just a short hop away in neighbouring Kalkan. Here, each suite has a private pool – perfect for cooling off after a busy day of sightseeing. 7. The hotel has a beach club on the 12km stretch of sand at Patara. To reach the sand, you must first walk through the ancient city. So far archaeologists have uncovered an impressive parliament building where representatives from the Lycian League met. 8. 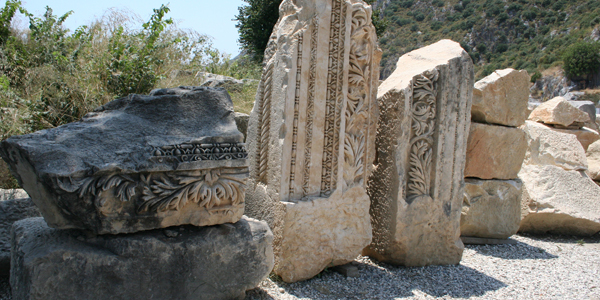 The Unesco-listed site of Xanthos was the capital city of the Lycian League. Many important monuments have been discovered here, including the Nereid Monument and the Tomb of Payava. Both are now exhibited at the British Museum – but don’t worry: there are still several spectacular ruins to marvel at. Our final stop is Villa Mandarin. Set in the unspoilt seaside town of Faralya, it’s a luxurious but laid-back hotel offering a romantic hideaway with a homely touch. 9. 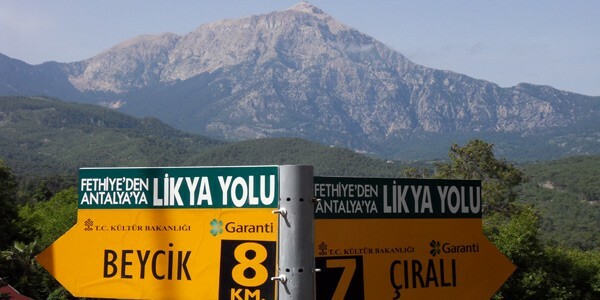 The Lycian Way runs for over 500km from Fethiye to Antalya, and an interesting section passes just behind the hotel. Follow it and you’ll be able to descend from the village to impressive Butterfly Valley, which is home to 40+ varieties of butterfly and boasts some stunning stretches of beach. 10. Atop a plateau lies Tlos, one of the oldest and largest settlements of Lycia. 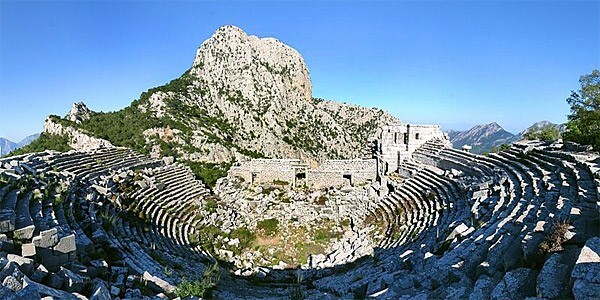 It’s worth visiting for its rock tombs, fortified acropolis and atmospheric theatre. It was subsequently inhabited by the Romans, the Byzantines and eventually the Ottoman Turks, meaning it’s one of the few Lycian cities to be continually inhabited until the 19th century. Find out more about this incredible area and to see other places to stay in Turkey.